As our impromptu dinner party was centered around a traditional Italian dish, a green salad seemed like a natural choice, as did a starter comprised of a variety of Italian cheeses selected with help from the incredibly knowledgeable cheese guru at Central Market. (Pecorino Toscano, Caciotta di Capra and Asiago Fresco Pressato Monti Trentini – particularly delicious with a little creamy pesto on a cracker). But we needed something else. Something easy. (Did I mention that I had to get the house ready, table set, flowers arranged, bar set up, etc. in less than six hours? And I was still at the office.) Something healthy. Something warm, delicious and a little surprising. Then it hit me: gingered baby carrots! We found this wonderful recipe on the Williams-Sonoma website a couple of years ago and love it. And we’d only served it once to guests, namely my parents who were not to join us for the Italian birthday potluck. This simple dish is a wonderful complement to either a meat or vegetarian entree and is packed with nutritional essentials including vitamins C and E, Thiamin and Potassium. Even more, carrots are a very good source of dietary fiber, vitamins A, K and B6 and Manganese. Good and good for you. We always buy bunches of small, organic carrots available at Central Market for this dish. But if you can’t find the little ones, peel full sized carrots down to no more than a half inch diameter (at the top, near the greens). A fragrant honey mixes beautifully with the crystalized ginger and mint that make this dish such a delicious smash! Remove greens from carrots and peel. Put the butter in a roasting pan just large enough to hold the carrots in a single layer and place in the preheating oven. Watch carefully to prevent burning. When the butter has melted, remove the pan from the oven and stir in the honey and crystallized ginger. Add the carrots and stir to coat them evenly. Season with salt and pepper and sprinkle with 1 1/2 Tbs. of the chopped mint. Stir again, then spread the carrots out in a single layer. Roast the carrots, stirring 2 or 3 times, until golden, glazed and tender when pierced with a fork, 35 to 45 minutes, sometimes longer depending upon the diameter of the carrot. Remove the pan from the oven and season the carrots with salt and pepper. Sprinkle evenly with the remaining 1 1/2 tsp. mint and the lemon juice and toss to coat. 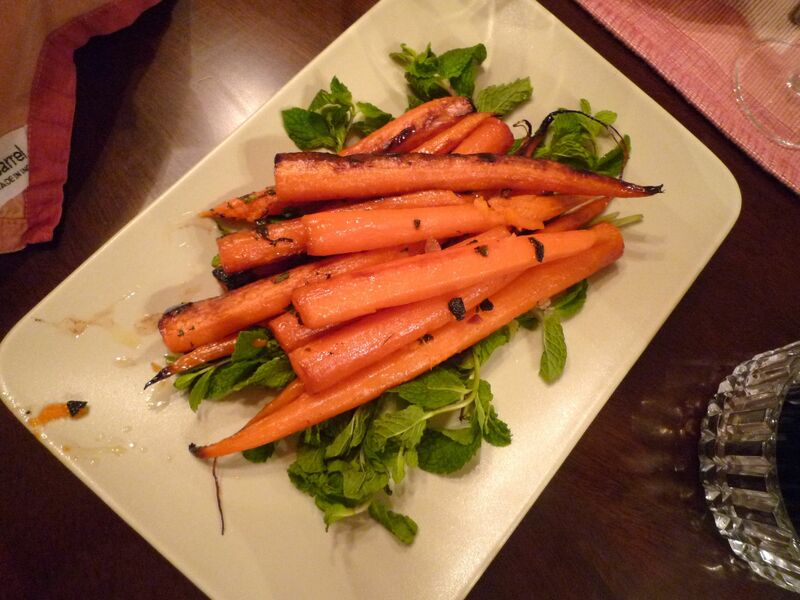 Make a bed of the mint sprigs on a platter and top with the carrots. Serve immediately. Serves 4. Adapted from Williams-Sonoma, Essentials of Roasting, by Rick Rodgers, Melanie Barnard & Bob & Colleen Simmons (Oxmoor House, 2004). I was the birthday girl! That was before the thought of food has become unbearable. It’s true. Our birthday girl hasn’t been feeling so hungry (or well) lately. But, like the rest of us, needs all those important nutrients found in delish veggies like these. The carrots were delicious and pretty! I’d definitely make them for any dinner party– fancy without the fuss! “Fancy without the Fuss!” What a perfect way to describe this dish. They have so little hands on time and such a delectable looking (not to mention tasting) final product! Everything in your blog looks delicious! Thanks Jennie. The same can be said said for yours. Now if I only spoke Swedish! By chance, do you have an English translation of your carrot soup with chili cream recipe? It looks so good – and it is definitely the time of year for soup.